topics and emerging research topics and design methods. The Digital Media M.A. program will participate as part of the first wave of programs located in downtown Orlando as part of a new downtown campus. Already active there are several programs and centers that are located at the Center for Emerging Media (CEM). CEM is a space for collaborative, creative, and cutting-edge work in the arts, humanities, education, and entertainment. CEM is currently home to CityLab, CREATE (Center for Research and Education in Arts, Technology and Entertainment), FIEA (Florida Interactive Entertainment Academy), Flying Horse Editions, Studio 500, and UCF Downtown. Digital Media-related research also flourishes near the main UCF campus at the Institute for Simulation and Training (IST) in Research Park, and faculty and students currently participate in related, cutting-edge research as part of other research labs and centers such as the Games Research Lab. Our faculty have published and exhibited their work widely, including at the Smithsonian, and have received funding from such prestigious organizations as the National Endowment for the Humanities and the Bureau of Educational and Cultural Affairs (which offers the Fulbright program). Funding support for graduate students is available on a competitive basis through fellowships (Provost’s Fellowship) and Graduate Teaching Assistantships (GTA). 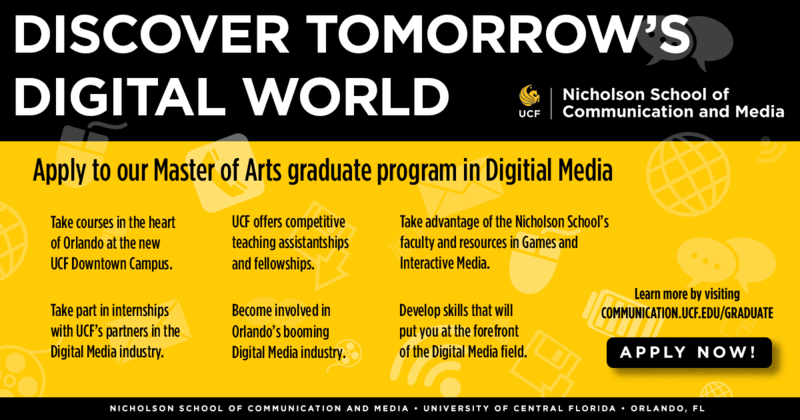 More information on funding can be found at the following link: https://funding.graduate.ucf.edu/. In addition, faculty who direct grant-funded research frequently offer research assistantship opportunities. Students who have graduated from our Digital Media programs have gone onto work for major companies including Amazon, Apple, Facebook, Google, Microsoft, NPR, and WebMD. Others have found success with positions at local and national games and simulation companies such as Leidos, Epic Games, and Mountain Savage Games. In addition, they have done internships with such prestigious organizations and companies as the Carnegie Museum of Natural History and Electronic Arts. Application Priority Deadline is January 15, 2019 and the final deadline for admissions consideration is July 15, 2019.